Petri Nets were defined for the study of discrete events systems and later extended for many purposes including dependability assessment. In our knowledge, no book deals specifically with the use of different type of PN to dependability. We propose in addition to bring a focus on the adequacy of Petri net types to the study of various problems related to dependability such as risk analysis and probabilistic assessment. In the first part, the basic models of PN and some useful extensions are briefly recalled. In the second part, the PN are used as a formal model to describe the evolution process of critical system in the frame of an ontological approach. 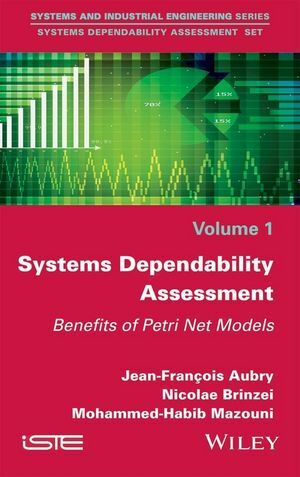 The third part focuses on the stochastic Petri Nets (SPN) and their use in dependability assessment. Different formal models of SPN are formally presented (semantics, evolution rules…) and their equivalence with the corresponding class of Markov processes to get an analytical assessment of dependability. Simplification methods are proposed in order to reduce the size of analytical model and to make it more calculable. The introduction of some concepts specific to high level PN allows too the consideration of complex systems. Few applications in the field of the instrumentation and control (l&C) systems, safety integrated systems (SIS) emphasize the benefits of SPN for dependability assessment. Pr. Dr. Jean-Francois AUBRY, Professor Emeritus, University of Lorraine, France. Dr. Nicolae BRINZEI, Associate University of Lorraine.